Let me tell you a little secret: I have always wanted to be a zookeeper. I even majored in biology in college to become a zookeeper! I have experience taking care of and watching over animals that are not normally considered (and should never be considered) pets. I even got the nickname "Bobcat Whisperer" from working at a sanctuary. Needless to say, I know a thing or two about being a zookeeper, and this game? It knows NOTHING. 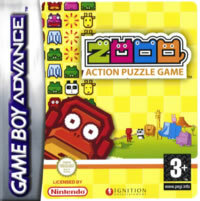 To give the basics of Zooo, or Zookeeper, it is a Match-3 game where the goal varies depending on the mode you choose. There's a timed mode, where you see how high of a score you can get in six minutes. A similar mode sees how fast you can reach 20,000 points. The "Normal" mode just has you collecting/matching a certain number of several kinds of animals. Its in-game description was rather odd too: "Level is up when you capture a certain number of animals". Geez, fire the editor. The Tokoton (don't bother trying to figure out what it means. 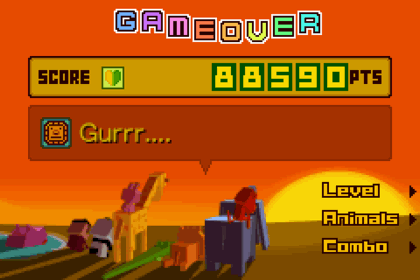 I hit a zillion dead ends and then some) involves how quickly the player can collect 100 of each animal. The "Quest" mode was translated rather strangely. Its description reads: "8 Questions. How many points can you get?" Naturally, I thought it might be a quiz game about the various animals or zookeeping or something. I was prepared for a break from all of this exhausting Match-3-ing and have a real mental challenge! I was extremely disappointed. There are no "questions" at all! The Quest mode simply gives you a variety of challenges to complete. Some of them are more luck-based than skill-based so it's rather frustrating at times, especially with that awful music looping around your head. If this game were an ice cream flavour, it would be plastic... with Splenda. The game plays just like any ordinary Match-3 game would. 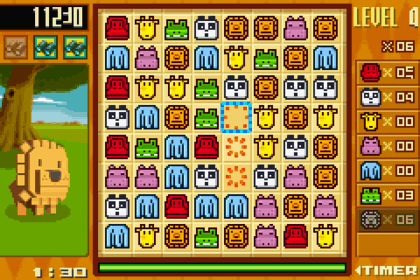 You use the direction pad to move around the screen and switch animal blocks in order to make matches. Now I've played plenty of Match-3 games, and none of them were ever this stressful! Not only is there a timer for reaching the level's goals, but there's a timer for making matches as well. That's right. If you don't make a match in a certain amount of time (which is usually between two minutes and two milliseconds), the entire level is over and you're greeted with a picture of the sad blocky animals mourning your loss after they "escape" from the zoo. That's basically the entire premise of the game: make matches so that the animals don't escape. As for the graphics in the game, oh boy. I get that they were maybe trying for a blocky "cutesy" look, but it didn't really pull through that way. I do commend them for their choice in match block coloring. The colors of each "animal" in the game is unique, so it's easy to spot out the ones that you need to make matches of. After a while, though, the game introduces another animal (a cute little pink bunny) that is a little too closely colored to the purple hippos. When you first turn on the game, you'll see a lovely parade of these animals. The only thing is that they are incredibly blocky. It almost reminds me of a kindergarten version of Minecraft. Match-3 games are a strange genre of gaming. They can be really good and fun or they can be frustrating and stressful. Usually the frustrating ones are because of obstacles that the game throws at you or because the game puts almost inhuman goals to accomplish. Zooo was neither of these, but yet I never actually had fun playing it. Maybe it was the overkill on timers or the blandness of the goals, but Zooo is a game that I'd rather erase from both my game library and my brain's memory. It's a game that tried to be cute and fun but just ended up being rather square.